These special transfer moulding presses suit rubber parts & DMC/ urea or switch gears or electrical parts manufacturing industries. These presses have all latest facilities including touch type panel screen, sliding & ejector arrangement & used to produce, engine mounting bellows, electrical switch gears, DMC & urea parts dead end & polymer insulators. 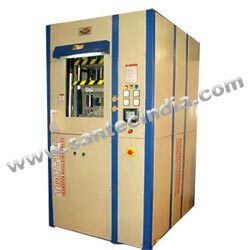 This machine is accepted by top industries in India & other industries in abroad because of its unique operating principle. Low cost in comparison of injection molding machines. Product quality is equivalent to injection moulded parts. Fast production & Better product quality in comparison of compn. Molding presses. Special Screw mechanism preventing rubber strip rupture during feeding. Acurate Temp. Control at all areas before Injection. Material flow with low restrictions. Cleaning & maintenance of all parts very easy. Injection system is based on "FIFO" system. Closed loop speed control of three Injection steps & exact positioning due to use of rotary encoders. Accurate Temp. regulation by PLC. Variable pump with proportional pressure & flow control.